Syria’s main opposition group, the National Coalition, welcomed an announcement by France on Thursday that it and Britain were ready to arm rebels fighting to oust the regime of President Bashar al-Assad. “We consider it a step in the right direction... Assad will not accept a political solution [to the conflict] until he realizes he is faced with an [armed] force that will defeat him,” Coalition spokesman Walid al-Bunni told AFP. 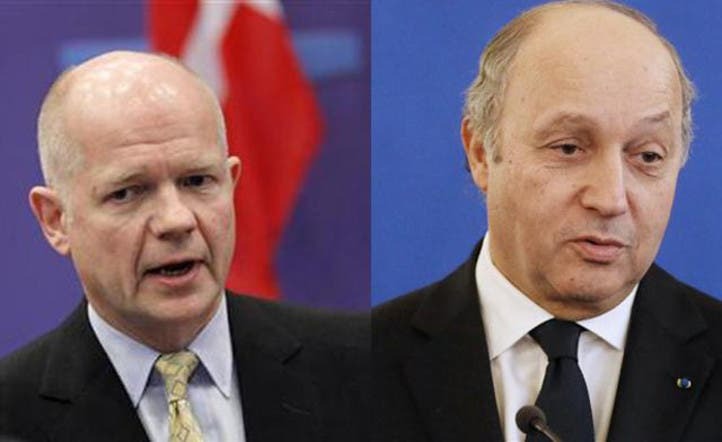 France and Britain said they were prepared to arm Syrian rebels even without unanimous EU support, French Foreign Minister Laurent Fabius said Thursday. Paris and London will call for moving up the date of the next European Union meeting on the Syrian arms embargo, and will decide to arm the rebels if the EU does not give unanimous agreement, he said previously. The UK has been pushing for this alongside France. “We've just amended [the arms embargo] so we can supply non-lethal equipment. I hope we can persuade our European partners, if and when a further change becomes necessary, they'll agree with us. But if we can't then it's not out of the question that we might have to do things in our own way. It's possible” said British Prime Minister David Cameron on Tuesday. Cameron made his remarks after being asked by the chairman of the common's foreign affairs select committee whether he was prepared to veto the EU arms embargo when it’s reviewed in May. Meanwhile, France’s foreign minister on Wednesday also called for lifting the EU arms embargo. “We must go further and allow the Syrian people to defend themselves against this bloody regime. It's our duty to help the Coalition, its leaders and the Free Syrian army by all means possible,” Fabius wrote in the daily Liberation newspaper. France and Britain want the European Union to amend the arms ban on Syria, which is part of a package of sanctions that rolls over every three months. “We must convince our partners, particularly in Europe, that we no longer have any other choice than to lift the embargo on arms to benefit the Coalition,” Fabius wrote in the article, timed to mark the conflict reaching two years. “More than 70,000 dead and a million refugees, the systematic destruction of a country: the second anniversary of the launch of the Syrian revolution is an anniversary of blood and tears,” he said. After weeks of wrangling, Britain has persuaded the EU to agree to relax its embargo to allow non-lethal but quasi-military aid such as body armor and armored vehicles to be supplied to the Syrian opposition. Germany said on Thursday it was ready to discuss within the European Union a lifting of the bloc's embargo on arming Syrian rebels. German Foreign Minister Guido Westerwelle highlighted in a written statement that European sanctions against Syria had been modified two weeks ago in line with the current situation. But he added: "If important partners in the European Union now see a different situation, which in their view once again makes a change of the sanction decisions necessary, naturally we are ready to discuss it immediately in the EU." Russia has warned that supplying Syrian rebels with arms would breach international law.